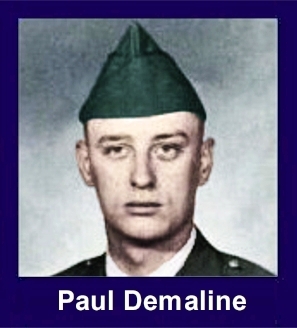 The 35th Infantry Regiment Association salutes our fallen brother, SP4 Paul Allen Demaline, who died in the service of his country on August 17th, 1970 in Binh Dinh Province, Vietnam. The cause of death was listed as Helicopter Crash. At the time of his death Paul was 20 years of age. He was from Delta, Ohio. Paul is honored on the Vietnam Veterans Memorial at Panel 08W, Line 118. The decorations earned by SP4 Paul Allen Demaline include: the Combat Infantryman Badge, the Bronze Star, the National Defense Service Medal, the Vietnam Service Medal, the Vietnam Campaign Medal and the Vietnam Cross of Gallantry with Palm Unit Citation. Paul- I miss you so much. I think my life would have turned out so much better & I would be a happier person if you were still here with me & the rest of our family. I hope you know your death made a huge void in the lives of many, especially mine. I know I was young when you went away, but I always felt so close to you, my big, protective brother. There are times when I see soldiers coming home in coffins on TV or hear taps that sends over the edge in uncontrollable sobbing. So you see, I am still trying to deal with your loss even after 40 years. I miss you & love you more than words could ever say. Hopefully, God willing, Ill be able to tell you myself someday.